Professionals with rich multifarious experience in the world’s leading Infrastructure enterprises joining together to create a vibrant, enterprise to wholesomely address the need of infrastructure industry in selected areas, Indus Consultrans’s vision is to blossom into a premier multi-disciplinary leading independent consultancy organization of Consulting engineers, designers planners and project managers. 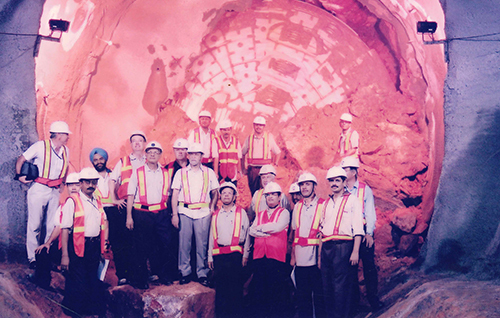 The offerings from Indus Consultrans encompass wide range of consultancy services in the areas of Civil, Structural, Electrical, Transportation Infrastructure and related engineering disciplines with twin-focus on Tunnelling / under-ground construction on one hand and integrated Mass rapid transit systems like metro, monorails etc on the other hand . It provides feasibility, bid-level support, project structuring assistance, project management, Construction supervision and Operation maintenance services. We provide feasibility, bid-level support, project structuring assistance, project management, construction supervision and operation maintenance services.Indus Consultrans aims to impart winning techno-managerial edge to the enterprises and to this end it aims to harness international technology from world leaders in the focus areas to provide innovative, cost-effective engineering solutions. Download the Brochure for a formal Indus Consultrans introduction. Know what makes Indus Consultrans one of the leaders among the bridges and tunnels construction companies! Underground Multiple-line – Metro Yard & underground Metro Stations at (Bimanabandar (NSC Bose Airport) & Cut & Cover tunnels in Metro Railway from Noapara to Barasat in Kolkata. Detailed Design Package UG 05 of Mumbai Metro Line III underground: Dharavi to mid ventilation shaft, 4 underground Stations, Twin TBM Tunnels 3.9km, NATM Tunnels, Shafts & structures.